A geothermal heat pump or ground source heat pump is a central heating or cooling system that transfers heat to or from the ground. They use the constant temperature of the earth as the exchange medium instead of the outside air temperature. Geothermal heat pumps are energy efficient and are widely used in various heating application across the surface water, recycled water, retention basin stormwater, sewage treatment plant, and harvested rainwater. A dual-source heat pump combines an air-source heat pump with a geothermal heat pump. Dual-source heat pumps have higher efficiency ratings than air-source units but are not as efficient as geothermal units. The main advantage of dual-source systems is that they cost much less to install than a single geothermal unit and work almost the same. Geothermal heat pumps use much less energy than conventional heating systems since they draw heat from the ground. They are also more efficient when cooling home. It not only saves energy and money but also reduces air pollution. The ability to reduce the electricity bill by 30 to 60 % when compared to traditional heating and cooling systems will make its adoption favorable among other available alternatives are the major factor driving the growth of the geothermal heat pumps market. In addition, low maintenance cost and full automation are also likely to boost the growth of the geothermal heat pumps market. Flexible seasonality of geothermal heat pumps that allows heating or cooling to external conditions in residential, industrial, and other applications. However, high cost and lack of consumer awareness about geothermal heat pump’s benefit are likely to hamper the development of geothermal heat pumps market. Furthermore, geothermal heat pumps provide less energy consumption and help in minimizing greenhouse gas emissions that are further anticipated to provide several growth opportunities for the key players in the geothermal heat pumps market over the upcoming years. Among the geographies, Europe accounted for the largest market share followed by North America. The growth in the Europe region is due to the increasing investment for infrastructure for green building along with increasing demand for heating and cooling system. Moreover, a scheme for the Renewable Heat Incentive (RHI) initiated by the UK government has supported the growth of the geothermal heat pumps market. 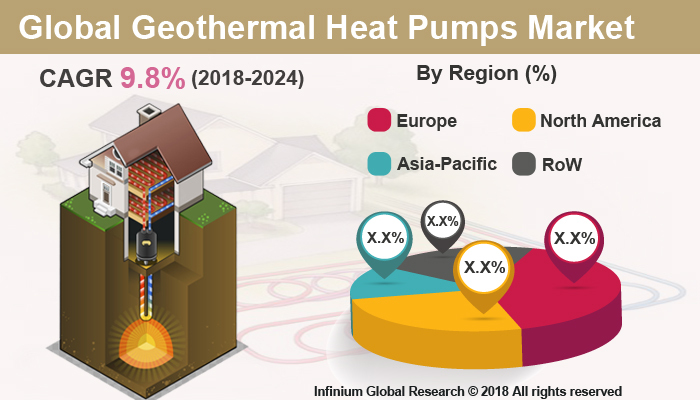 Increasing demand for renewable energy resources and availability of shallow and ground temperature is projected to boost the demand for geothermal heat pumps in the countries such as Canada and U.S. Furthermore, the demands for retrofitted geothermal heat pumps are probable to toughen the Asia Pacific market growth over the forecast period. The report on global geothermal heat pumps market covers segments such as type and applications. On the basis of type, the global geothermal heat pumps market is categorized into closed-loop systems and open-loop system. On the basis of applications, the global geothermal heat pumps market is categorized into residential, commercial and industrial. The report provides profiles of the companies in the global geothermal heat pumps market such as, NIBE, Robert Bosch, Kensa Heat Pumps, Finn Geotherm, Stiebel Eltron, Vaillant Group, Bard HVAC, Bryant Heating & Cooling Systems, Ecoforest, and Glen Dimplex. The report provides deep insights on demand forecasts, market trends, and micro and macro indicators. In addition, this report provides insights into the factors that are driving and restraining the global geothermal heat pumps market. Moreover, IGR-Growth Matrix analysis given in the report brings insight into the investment areas that existing or new market players can consider. The report provides insights into the market using analytical tools such as Porter's five forces analysis and DRO analysis of geothermal heat pumps market. Moreover, the study highlights current market trends and provides forecast from 2018-2024. We also have highlighted future trends in the geothermal heat pumps market that will impact the demand during the forecast period. Moreover, the competitive analysis given in each regional market brings insight into the market share of the leading players. This report will help manufacturers, suppliers, and distributors of the geothermal heat pump market to understand the present and future trends in this market and formulate their strategies accordingly.